The SFRplus Photographic Multi-Size target is ideal for a variety of specialized testing applications. This chart is of particular interest for endoscope and medical device manufacturers, as the always-on, embedded light sources of these instruments often prevents the use of a high-resolution transmissive target. 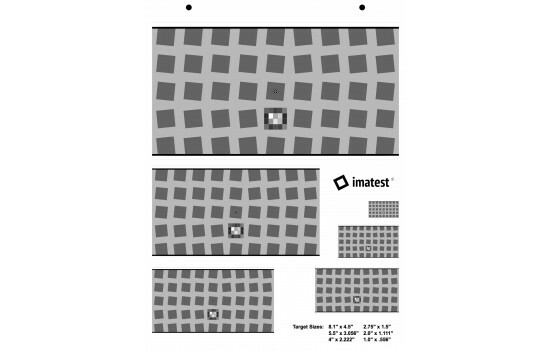 The SFRplus test chart can be used with Imatest to measure MTF, lateral chromatic aberration, distortion, and tonal response in addition to other image quality factors. The SFRplus module features fully automated region-of-interest detection. The SFRplus chart offers significant advantages over commonly used charts such as the ISO 12233 chart. Some of these advantages are less wasted area, the ability to produce a map of sharpness over the sensor surface, better measurement accuracy, and full support for automated testing.